Kade has a new "job" for class, writing for the class paper, Weekend News. The kids are given a writing assignment, the teacher edits it, and then the kids have to do a rewrite. Here's Kade's first rewrite. Mickey pointed out that he still had a couple errors, Hershey dar. Apparently I didn't look over it when he was done. He'll fix those in the morning. My favorite part is the picture to go with the story. In case you can't figure it out he drew himself as Captain America with his shield. The head above it is an "old lady" giving him candy, specifically a Hershey bar. The only reason I know what that black triangle floating on the right is is because Kade told me it was the doorbell. Okay, if you say so. I look forward to what other news he reports on. 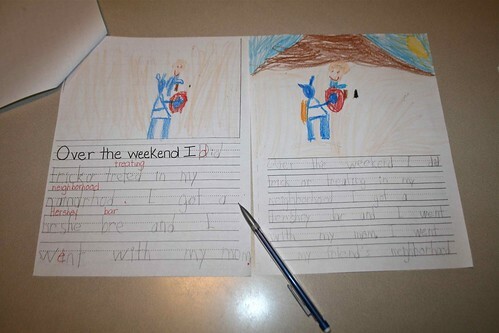 Maybe I need to make an effort to have good weekends so he'll have something to write about.